Meghalaya Chief Minister Conrad K. Sangma and Agriculture Minister Banteidor Lyngdoh along with a delegation participate at SIAL Paris 2018. 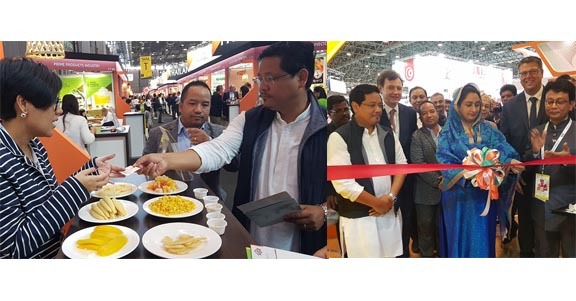 Meghalaya Chief Minister Conrad K. Sangma and Agriculture Minister Banteidor Lyngdoh along with a delegation on Sunday participated at SIAL (Salon International de l’alimentation) Paris 2018, one of world’s biggest food innovation exhibitions. The visit to SIAL comes in wake of Meghalaya establishing its new Directorate of Food Processing to promote value addition of different agri-horti products. “It is important to understand trends of the industry. We are here with our team of officials to engage with different companies and explore potential to market our products,” Conrad K. Sangma said, while stating that through this visit the State would be able to devise strategy for innovative product Start Ups. This year, India also hosted the first edition of ‘Food India by SIAL’ in New Delhi in an effort to showcase the diversity in product development and potential of food business in India. Union Minister for Food Processing Harsimrat Kaur Badal is also part of this mega food exhibition along with her delegation in Paris. She inaugurated the India stall in presence of Chief Minister and Agriculture Minister. “”The world has realised the potential of India in food processing. However, it is important for us to learn from advanced nations and collaborate with industry for transfer of modern technology. We are looking forward to ensure that through value addition the immense potential of our agri-horti products can be positioned in major world markets,” the Chief Minister said. He informed that Meghalaya is looking at options for technology, machinery to build an efficient supply chain as well on development of product, branding to establish its unique identity, stated a CMO, Meghalaya press communique. Conrad Sangma expressed confidence that through ‘Pradhan Mantri Kisan Sampada Yojana’ initiated by the Government of India, Meghalaya would be able to reap the benefit as Ministry of Food Processing have started the ground work for starting a cold chain grid throughout the country for seamless transfer from production to consumption. “SIAL has given an opportunity to network with industry professionals from across the globe, learn the latest industry trends, innovations, and broaden business potential,” said Agriculture Minister Banteidor Lyngdoh. This edition of SIAL 2018 will mark the big comeback of taste, it added.